The relationships between cumulative family risk factors and American students’ academic performance were examined in all 50 States and the District of Columbia. Data from the 2007 American Community Survey were used to ascertain the percent of birth to 18 year old children in the United States who experienced three or more risk factors. The outcome measures were the 2007, 2009, 2011, and 2013 National Assessment of Educational Progress 4th and 8th grade reading and mathematics scores and high school graduation rates. Results showed that between 40% and 64% of the variance in students’ academic performance was accounted for by cumulative family risk factor measure. The results indicate a need to consider, if not take into consideration, family influences outside of schools as part of improving student academic performance. Copyright © 2016 Science and Education Publishing. All Rights Reserved. Dunst, Carl J., and Deborah W. Hamby. "Effects of Cumulative Family Risk Factors on American Students’ Academic Performance." American Journal of Educational Research 4.2 (2016): 150-154. Dunst, C. J. , & Hamby, D. W. (2016). Effects of Cumulative Family Risk Factors on American Students’ Academic Performance. American Journal of Educational Research, 4(2), 150-154. Dunst, Carl J., and Deborah W. Hamby. "Effects of Cumulative Family Risk Factors on American Students’ Academic Performance." American Journal of Educational Research 4, no. 2 (2016): 150-154. Findings in A Nation At-Risk  spurred intense interest in school reform to improve students’ academic performance that has lasted more than three decades [e.g., [2, 3, 4]]. Despite improvements in elementary, middle, and high school students’ academic performance since the A Nation At-Risk report [5, 6, 7], American students’ average reading, mathematics, and science scores continue to lag behind the performance of almost half of the 64 countries participating in the Program for International Student Assessment . In addition, the academic progress of American students has plateaued to the point that average National Assessment of Educational Progress (NAEP) scores have shown little or no changes during the past decade [6, 9]. The search for explanations accounting for the lack of sustained student progress both as a nation and in individual states and jurisdictions finds that factors outside rather than inside schools account for the largest amount of variability in students’ academic performance [10, 11, 12, 13, 14]. LeFevre , for example, in his analysis of the correlates of students’ academic performance in all 50 States and the District of Columbia, concluded that “there is no evident correlation between pupil-to-teacher ratios, spending per pupil, and teacher salaries on the one hand, and educational achievement as measured by various standardized test scores on the other. In other words, lawmakers need to…look beyond these conventional measures of educational investment to find the keys to educational achievement” (p. 3). In contrast, family, parent, and neighborhood factors including, but not limited to, family socioeconomic status and income, parent education and marital status, and family housing conditions, have been found to be more highly correlated with variations in students’ academic performance [e.g., [15, 16, 17, 18]]. Closer examination of factors correlated with students’ academic performance finds factors both inside and outside of schools related to variations in students’ achievement where the sizes of effect are 2 to 3 times larger for outside compared to inside school factors [9, 12, 19, 20]. In addition, the more adverse are students’ life circumstances, the poorer are their academic performance as found in studies examining the relationships between the presence of multiple school and family risk factors and students’ academic performance [21, 22, 23, 24]. Whipple et al. , for example, investigated the effect of cumulative family and school risk factors on students’ academic achievement in the nation’s largest school district and found that the more risk factors experienced by students, the fewer students who met academic standards. Except for results reported in Scott et al. for the effects of cumulative risk factors for school failure on students’ 12th grade mathematics performance, no similar types of risk factor analyses have been conducted for individual states and jurisdictions. The purpose of analyses described in this paper was to determine if the cumulative number of family risk factors experienced by children in each State and the District of Columbia was correlated with students 4th and 8th grade National Assessment of Educational Progress scores  and 12th grade graduation rates . Based on cumulative risk factor models [23, 28], we expected to find that the larger the percent of children in a state or jurisdiction who experienced multiple risk factors, the lower would be the students’ average NAEP scores and high school graduation rates. Based on ecological systems theory [29, 30], we expected to find that the presence of multiple family risk factors in social systems outside of schools would be negatively related to students’ academic performance. As noted by Whipple et al. , integrating research on cumulative risk factors and ecological systems theory has the potential of identifying how social systems factors not explicitly the focus of educational initiatives can nonetheless reverberate and negatively affect students’ academic performance. Data from the 2007 American Community Survey compiled by Kominski, Elliott, and Clever  on 73,590,243 children birth to 18 years of age in all 50 States and the District of Columbia were used to ascertain the percent of children in each state and jurisdiction who experienced multiple risk factors. The 22 risk factors investigated by Kominski et al. as potential determinants of child well-being are listed in Table 1 organized by risk category, the percent of children in the nation who experienced the 22 risk factors, and the rank ordering of the risk factors according to the percent of children experiencing the risk factors. Kominski et al. also determined for each State and the District of Columbia the percent of children experiencing no risk factors, 1 or 2 risk factors, 3 to 7 risk factors, and 8 or more risk factors. The cumulative family risk factor measure used in the analyses described in this paper was the percent of children who experienced three or more risk factors because the negative effects of multiple risks begins to be manifested among children who experience three or more risk factors [e.g., [23, 32, 33, 34]]. Table 2 lists the States and District of Columbia from the lowest to the highest percent of children experiencing three or more risk factors. The average number of risk factors for all states and jurisdictions combined was 32.58 (SD = 7.59, Range = 20% to 57%). The smallest percent of children experiencing multiple risks was in New Hampshire and North Dakota, whereas the largest percent of children experiencing multiple risks was in California and the District of Columbia. The average 4th grade and 8th grade NAEP reading and mathematics scores in each State and the District of Columbia in 2007, 2009, 2011, and 2013 were used as the elementary and middle school academic performance measures [34, 35, 36, 38]. The average percent of freshman students graduating from high school in 2007, 2009, and 2011 were used as the 12th grade academic performance measure [27, 36, 37]. The 4-year adjusted high school graduation rate in 2013 was used as a proxy for the freshman graduation rate since the later was not yet available at the completion of this study . Table 3 shows the number of students who participated in the NAEP 4th and 8th grade reading and mathematics assessments, the total number of students who graduated from high school, the average NAEP scores for all 50 States and the District of Columbia in the 4th and 8th grades, and students’ high school graduation rates. There were only two to four point differences in the average NAEP 4th and 8th grade reading and mathematics performance measures for the four years of outcome data, and except for 2007, the between year differences in the high school graduation rates varied by only three percent. 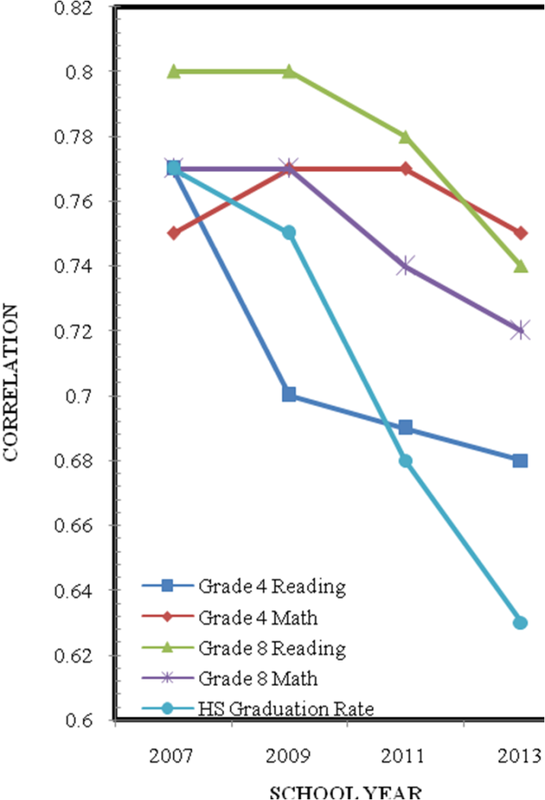 The results, taken together, indicate very little change in the academic performance of American students during the course of the four school years constituting the focus of analyses in this paper. The correlations between the cumulative family risk factor measure and students’ academic performance are shown in Table 4. In all 20 analyses, the presence of multiple risk factors was negatively correlated with student performance. The results showed that the larger the percent of children in the States and District of Columbia who experienced three or more risk factors, the lower were the 4th and 8th grade reading and mathematics NAEP scores and the smaller the percent of students who graduated from high school. The amount of variance accounted for in students’ academic performance by the cumulative family risk factor measure ranged between 40% and 64%. Despite the fact that the 2007 American Community Survey family risk factor measure was significantly correlated with all four years of academic performance outcome data, there are apparent downward trends in the sizes of effects of the cumulative number of risk factors for a number of student outcomes. Figure 1 shows the trends in the covariation between the predictor and outcome measures in terms of the correlation coefficients between risk factors and each outcome measure across all four years. The effect sizes for the trends were estimated by the standardized betas by regressing the correlation coefficients on performance measurement years. The betas for all the outcome measures except the Grade 4 mathematics scores, ranged between β = .89 and β = .98, indicating discernible downward trends in the sizes of effects for predicting academic achievement between 2007 and 2013 from the American Community Survey  cumulative family risk measure. Results from this study showed that cumulative family risk factors were a robust predictor of variations in American students’ academic performance in elementary, middle, and high school. Despite the fact that the amount of the variance accounted for in students’ academic performance became somewhat smaller the larger the amount of time between the predictor and outcome measures, the sizes of effect are considerably larger than found in previous studies of students’ academic performance in all States and the District of Columbia [e.g., [11, 25]]. This is the case because unlike the present study which used a cumulative family risk factor measure as a predictor, other studies examined the effects of only a few risk factors or employed a different research methodology. The results add to the knowledge base in terms of the effects of cumulative family risk factors on child development in general  and student academic performance in particular . The findings also highlight the fact that student-related factors outside of school can and do negatively affect academic performance as demonstrated by the results reported in this paper. The results, together with those from studies examining the moderating effects of both inside and outside of school promotive and protective factors [20, 21, 40], indicate that promotive and protective factors can lessen the negative effects of multiple risk factors at least to a certain extent [e.g., [20, 21, 24, 41]]. Lee and Shute , for example, extensively reviewed the results for studies of different factors affecting student performance and identified a host of both student (personal) and family and school social-contextual factors that can and do have development-enhancing effects which are related to differences in students’ academic performance. These risk and opportunity factor perspectives of human development in general  and academic performance in particular  provide broader-based frameworks for investigating and understanding the inside and outside school influences that account for variations in students’ academic achievement [29, 43]. A number of limitations should be considered when interpreting the results in this paper. First, analyses at the state-level fail to consider and take into consideration variations in school districts within states and jurisdictions (e.g., Do cumulative risk factors have similar effects in school districts that differ in terms of the presence of promotive or protective factors?). Second, the measure used for ascertaining cumulative risk  was one of convenience where an aggregated and not a gradient measure of risk was used to predict academic performance. This may have underestimated the impact of the risk factors on students’ academic performance inasmuch as the more risk factors experienced by children, the more negative are the effects on child outcomes [e.g., ]. Third, the relationships between family and school risk factors and academic performance, and the moderators of these relationships, were not able to be examined in the study described in this paper which would likely have had additional explanatory value [see [20, 21]]. Fourth, the particular risk factors that attenuated student academic performance were not able to be ascertained because the risk factor data were not presented by Kominski et al. in that manner. Notwithstanding these limitations, the results indicate that school reform to improve student academic performance must at least consider, if not take into consideration, family influences outside of school if meaningful changes are to be realized in American students’ academic performance [14, 30]. National Commission on Excellence in Education, A nation at risk: The imperative for educational reform: A report to the nation and the Secretary of Education, United States Department of Education. 1983, Washington, DC: The Commission. American Institutes for Research, Three decades of education reform: Are we still "a nation at risk?". 2013. Borek, J., A nation at risk at 25. Phi Delta Kappan, 2008. 74(8): p. 572-574. Wong, K.K., J.W. Guthrie, and D.N. Harris, A nation at risk: A 20-year reappraisal. Peabody Journal of Education, 2004. 79(1): p. Special Issue. Forgione, P.D., Achievement in the United States: Progress since a nation at risk? 1998, Washington, DC: U. S. Department of Education. 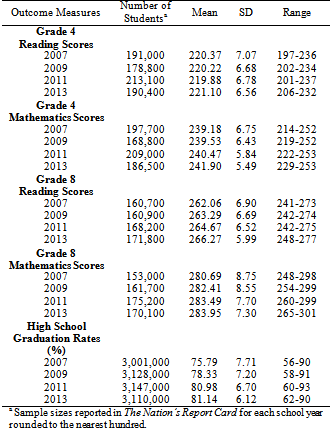 National Center for Education Statistics, The nation's report card: Trends in academic progress 2012 (NCES 2013 456). 2013, Washington, D.C.: Institute of Education Sciences, U.S. Department of Education. LeFevre, A.T., Report card on American education:A state-by-state analysis, 1985-1986 to 2006-2007. 2008, Washington, DC: American Legislative Exchange Council. Organization for Economic Cooperation and Development, PISA 2012 results in focus: What 15-year-olds know and what they can do with what they know. 2014, Paris, France: Author. Coulson, A., State education trends: Academic performance and spending over the past 40 years. 2014. LeFevre, A.T., Report card on American education: A state-by-state analysis. 15th ed. 2008, Washington, DC: American Legislative Exchange Council. Grissmer, D.W., et al., Improving student achievement: What state NAEP test scores tell us. 2000, Santa Monica, CA: RAND. Lee, J. and T. Reeves, Revisiting the impact of NCLB high-stakes school accountability, capacity, and resources: State NAEP 1990-2009 reading and math achievement gaps and trends. Educational Evaluation and Policy Analysis, 2012. 34(2): p. 209-231. 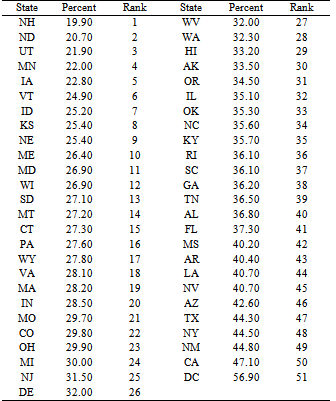 U. S. Chamber of Commerce Foundation, Leaders & laggards: A state-by-state report card on K–12 educational effectiveness. 2014, Washington, DC: Author. Hanushek, E.A., P.E. Peterson, and L. Woessmann, Endangering prosperity: A global view of the American school. 2013, Washington, D. C.: Brookings Institution. Sirin, S.R., Socioeconomic status and academic achievement: A meta-analytic review of research. Review of Educational Research, 2005. 75(3): p. 417-453. Reardon, S.F., The widening academic achievement gap between the rich and the poor: New evidence and possible explanations, in Whither opportunity? : Rising inequality, schools, and children's life chances, G.J. Duncan and R.J. Murnane, Editors. 2011, Russell Sage Foundation: New York. p. 91-116. Lacour, M. and L.D. Tissington, The effects of poverty on academic achievement. Educational Research and Reviews, 2011. 8(7): p. 522-527. Willingham, D.T., Ask the cognitive scientist: Why does family wealth affect learning? American Educator, 2012. 36(1): p. 33-39. Lee, J. and V.J. Shute, Personal and social-contextual factors in K–12 academic performance: An integrative perspective on student learning. Educational Psychologist, 2010. 45(3): p. 1-19. O’Malley, M., et al., School climate, family structure, and academic achievement: A study of moderation effects. School Psychology Quarterly, 2015. 30(1): p. 142-157. 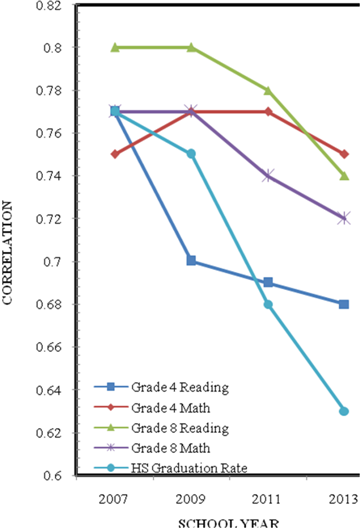 Swanson, J., C. Valiente, and K. Lemery-Chalfant, Predicting academic achievement from cumulative home risk: The mediating roles of effortful control, academic relationships, and school avoidance. Merrill-Palmer Quarterly, 2012. 58(3): p. 375-408. Suh, S. and J. Suh, Risk factors and levels of risk for high school dropouts. Professional School Counseling, 2007. 10: p. 297-306. Evans, G.W., D. Li, and S. Sepanski Whipple, Cumulative risk and child development. Psychological Bulletin, 2013. 139(6): p. 1342-1396. Whipple, S.S., et al., An ecological perspective on cumulative school and neighborhood risk factors related to achievement. Journal of Applied Developmental Psychology, 2010. 31(6): p. 422-427. Scott, L.A., S.J. Ingels, and J.A. Owings, Interpreting 12th-graders’ NAEP-scaled mathematics performance using high school predictors and postsecondary outcomes from the national education longitudinal study of 1988 (NELS:88): Statistical analysis report. 2007, Washington, DC: U.S. Department of Education, National Center for Education Statistics. National Center for Education Statistics, National assessment of educational progress. 2015, Washington, DC: Institute of Education Sciences. Stetser, M.C. and R. Stillwell, Public high school four-year on time graduation rates and event dropout rates: School years 2010-11 and 2011-12. First look (NCES 2014-391). 2014, Washington, DC: U.S. Department of Education, National Center for Education Statistics. Gutman, L.M., A.J. Sameroff, and J.S. Eccles, The academic achievement of African American students during early adolescence: An examination of multiple risk, promotive, and protective factors. American Journal of Community Psychology, 2002. 30(3): p. 367-399. Brooks-Gunn, J., Children in families in communities: Risk and intervention in the Bronfenbrenner tradition, in Examining lives in context: Perspectives on the ecology of human development, P. Moen, G.H. Elder, Jr., and K. Luscher, Editors. 1995, American Psychological Association: Washington, DC. p. 467-519. Berns, R.M., Child, family, school, community: Socialization and support. 2013, Belmont, CA: Wadsworth, Cengage Learning. Kominski, R., D. Elliott, and M. Clever. 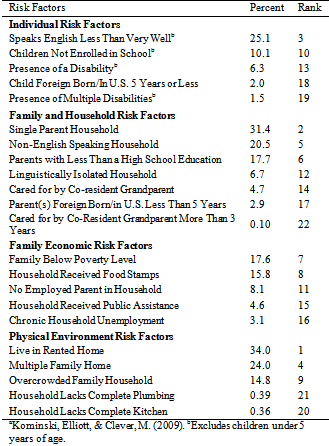 Risk factors for children in the U.S., states, and metropolitan areas: Data from the 2007 American Community Survey 1-year estimates. in the annual meeting of the Population Association of America. 2009. Detroit, MI. Mrazek, P.J. and R.J. Haggerty, eds. Reducing risks for mental disorders: Frontiers for preventive intervention research. 1994, National Academy Press: Washington, DC. Sameroff, A., et al., Family and community influences on the development of child competence, in Families, risk, and competence, M. Lewis and C. Feiring, Editors. 1998, Lawrenc Erlbaum: Mahwah, NJ. p. 161-185. Dunst, C.J., C.M. Trivette, and D.W. Hamby, Relationships between family risk and opportunity factors and parent and child functioning. Journal of Educational and Developmental Psychology, 2014. 4(2): p. 10-23. Snyder, D.T. and S.A. Dillow, Digest of educational statistics 2013 (NCES 2015-011). 2015, Washington, DC: U.S. Department of Education, National Center for Education Statistics. Snyder, D.T. and S.A. Dillow, Digest of educational statistics 2011 (NCES 2012-011). 2012, Washington, DC: U.S. Department of Education, National Center for Education Statistics. Snyder, D.T. and S.A. Dillow, Digest of educational statistics 2009 (NCES 2010-013). 2010, Washington, DC: U.S. Department of Education, National Center for Education Statistics. Snyder, D.T., S.A. Dillow, and C.M. Hoffman, Digest of educational statistics 2007 (NCES 2008-022). 2008, Washington, DC: U.S. Department of Education, National Center for Education Statistics. National Center for Education Statistics, EDFacts/consolidated state performance report, school years 2010-11, 2011-12, and 2012-13. 2015: http://www2.ed.gov/admins/lead/account/consolidated/index.html. Burchinal, M., et al., Social risk and protective child, parenting, and child care factors in early elementary school years. Parenting: Science and Practice, 2006. 6: p. 79-113. Cebula, R.J., F.G. Mixon, and M.A. Montez, Teachers’ salaries and human capital, and their effects on academic performance: an institution-level analysis of Los Angeles County high schools. Journal of Economics and Finance, 2015. 39(2): p. 347-356. Garbarino, J., Children and families in the social environment. 2nd ed. 1992, New York, NY: de Gruyter. Bronfenbrenner, U., Ecological models of human development, in International encyclopedia of education, T. Husen and N. Postlethwaite, Editors. 1994, Elsevier: Oxford, UK. p. 1643-1647. Gutman, L.M. and A.J. Sameroff, Academic growth curve trajectories from 1st grade to 12th grade: Effects of multiple social risk factors and preschool child factors. Developmental Psychology, 2003. 39(4): p. 777-790. Copyright © 2012-2016 Science and Education Publishing Co. Ltd All rights reserved.